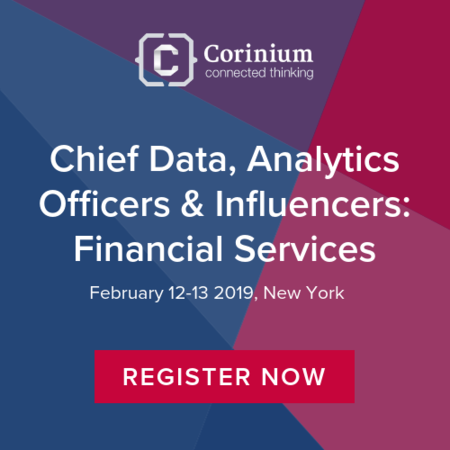 Chief Data Analytics Officers & Influencers: Financial Services (CDAOI) 2019 arrives in New York, February 12-13 for two days of networking and top level discussion. Featuring over 40 expert speakers from across the financial services industry, such as HSBC, Bank of China, AIG, BNY Mellon and many more! CDAO FS will present a multifaceted agenda and an audience of over 100 leaders working within a range of departments generating a cross-company collaboration. With an agenda designed with networking at the heart, 2019 will allow you to experience the unique Corinium discussion groups providing a platform to share ideas and experiences as well as enjoy content-led keynote presentations, panel discussions and masterclass.